Derek, a “pit bull” dog adopted from Animal Farm Foundation, recently earned the title Dog Scout as part of the Dog Scouts of America program. 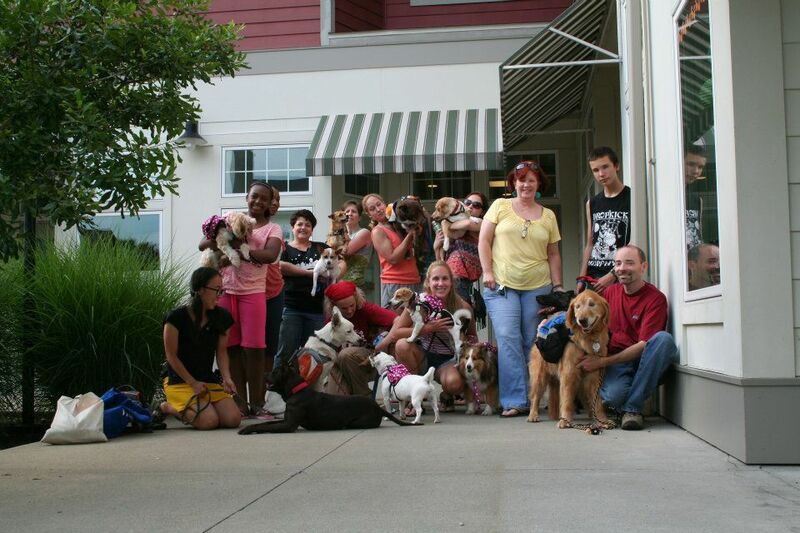 The Dog Scouts of America is a nonprofit group with troops in more than 20 states. Dedicated to celebrating the human-canine bond, the DSA, like any good scout troop, is also committed to community service. What is Dog Scouts of America? Local troops get together for training, fun outings, and civic service. The dogs, once they pass the Dog Scout certification test like Derek just did, are eligible to earn badges in different areas. Our local troop, The Hudson Valley Howlers, just formed this summer and we all chip in ideas about what activities to do and volunteer our own skill sets. For example, I gave a talk about dog body language and stress signals in dogs. Another member, trainer Polly Kaplan will share a clicker training and shaping class. We’ve also done group activities like geocaching, kayaking, apple picking, and we plan to volunteer to help the local community. Our troop consists of people and dogs of varying ages, skills, and temperaments. The goal is for everyone to learn more, do more, and be responsible, caring dog guardians that set great examples for the public, in terms of understanding and communicating with our dogs and having a strong human-canine bond. Can you tell us about Derek’s past, before you adopted him? Derek was brought to Southampton Animal Shelter in Long Island, NY and lived there for about six months, before he got transferred to Animal Farm Foundation. When he originally arrived at AFF, we got attached to each other pretty quickly. I’m pretty sure he knew, over a year before I took him in to foster, that I was supposed to be his person. He was adopted once from AFF, but due to separation anxiety, he came back. It’s hard to work with separation anxiety in a shelter environment, so I took him home to foster last year. It quickly became clear that he needed to stay with me – he was doing better being crated, but needed someone who would give him enough exercise, as well as other activities to keep his VERY busy mind occupied. We love our Dog Scouts troop because we get to try out new things all the time. Derek does great out in public. It’s perfect for us. How did you and Derek prepare for the Dog Scouts test? Derek and I are always working together every day. We train throughout the day as part of daily life. He already had basics down, from before I adopted him, and he passed his CGC and Therapy Dog tests without us having to prepare specifically for them at all. Most of the actual behaviors we filmed for the Dog Scout title didn’t require much additional preparation, except 2-10 minutes of practice before starting to film each portion. The test was submitted via video, so the biggest hurdle was having a second person to film and/or a third person to be a helper. We ended up getting help from a total of nine people, helper dogs, and a helper cat, so it kind of “took a village” to get it done. How is the DSA test different from the Canine Good Citizen (CGC) exam? Having taken both tests, I would say that the DSA test is slightly more difficult for the dogs to pass than the CGC and it requires a lot more effort and time on the human’s part. Some differences are the inclusion of a “heel” portion, two “leave it” exercises, and minor differences in the “on leash, near dog” portion that makes it more difficult for dogs that may have any leash reactivity. There’s also an extensive written test for the handler to take. Want to share what the evaluator said about Derek’s test video? They are going to add the video link to their site in the near future. Any other “pit bull” dogs in the group? Nope, not yet. 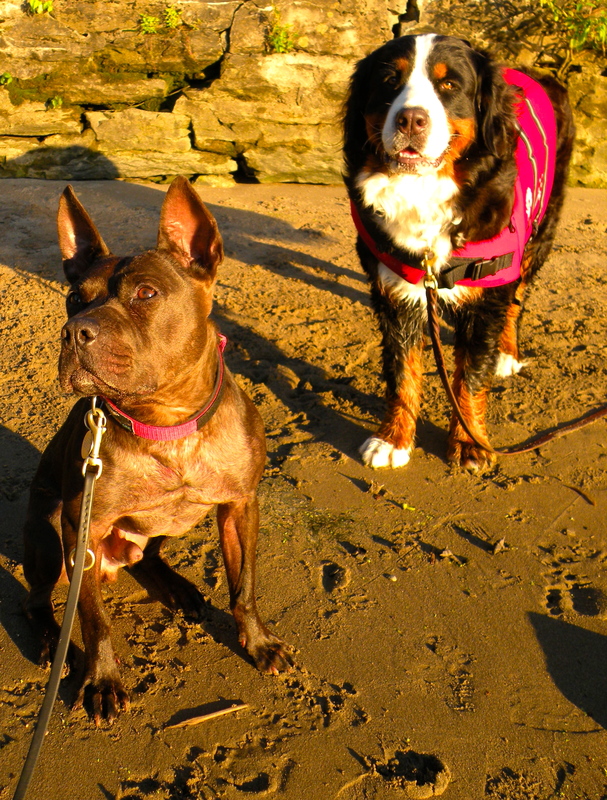 We do have a very wide variety of dogs – from a Chihuahua to a Bernese Mountain Dog and a lovely group of mutts. Some are rescues and others are from breeders. Local dog celebrity Dutchess the therapy dog, who happens to be blind, is also part of our troop, as well as a handsome dog named Darwin who is deaf. Everyone is welcome! Do you think being a part of DSA help change the public’s perception of “pit bull” dogs? I think the perception is that Derek being a “pit bull” dog is a non-issue or an afterthought. I don’t think anyone in our group has ever even asked me about what kind of dog Derek is or made any comment about his possible breed. When people outside our troop see us amongst the group, my hope is that they see how well-behaved he is and notice that first, before thinking about what kind of dog he might be. So far, all we’ve gotten are nice comments about his disposition. Congratulations to Hanna and Derek, CGC, Therapy Dog, ITD, DSA! Previous BSL: Which Side Are You On?